Have four people come up front. 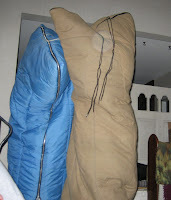 Put sleeping bags over two of them as they stand on their knees. They have to wrestle the other person to the floor. Then have the next two go, and finally have a championship round. Usually the heaviest person wins so try and pick people that weigh about the same. You can play a trick on one of the kids, by taking the bag off of the girl in a girl vs. guy round.